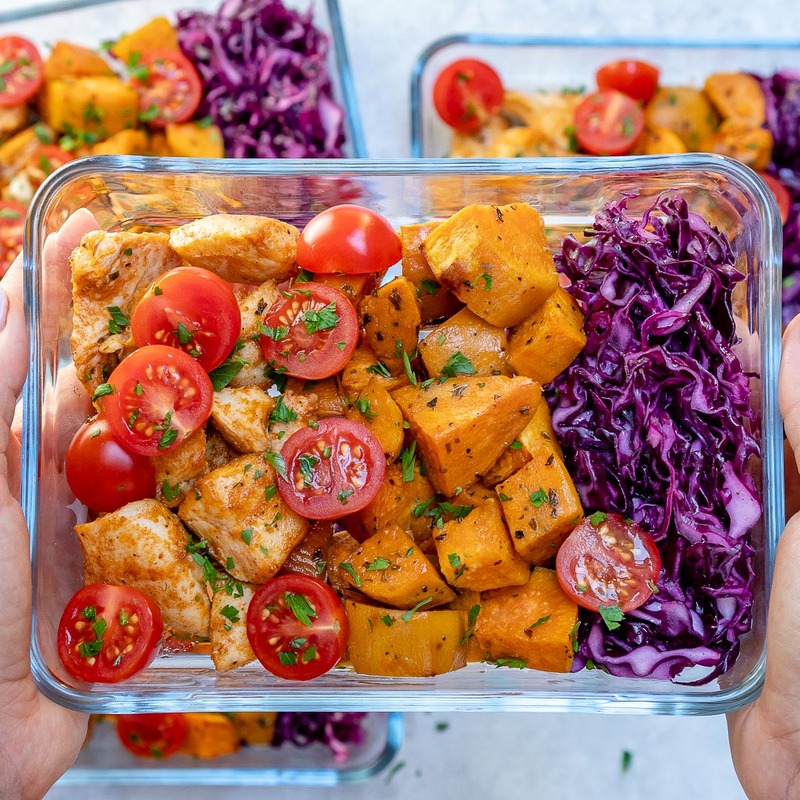 Tasty chicken morsels + crispy roasted sweet potatoes + tangy fresh shredded cabbage = Perfectly balanced nutrition for your week ahead with MAJOR FLAVOR! 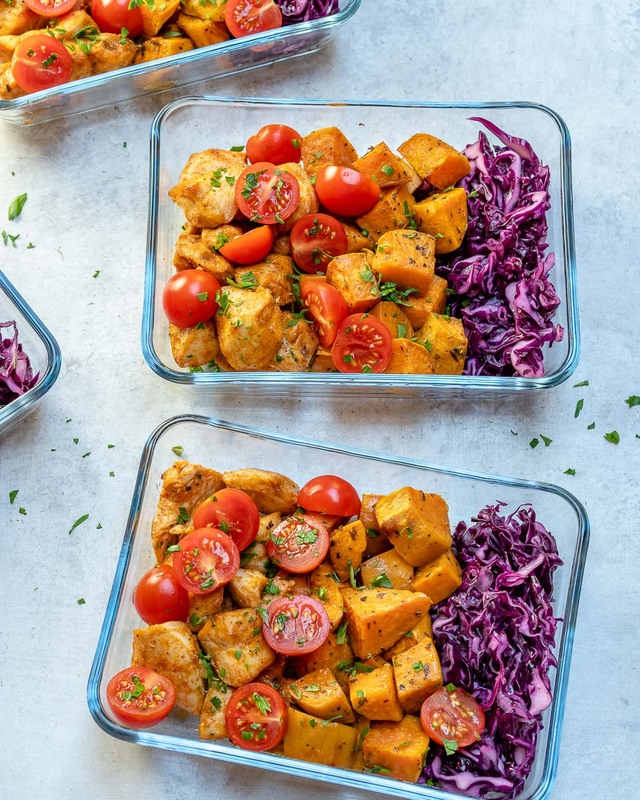 In a large glass bowl, toss chicken with paprika, cumin, sea salt and pepper and 1 Tablespoon of oil. Toss to combine well; set in the fridge, covered for about 30 minutes while you prepare the other ingredients. 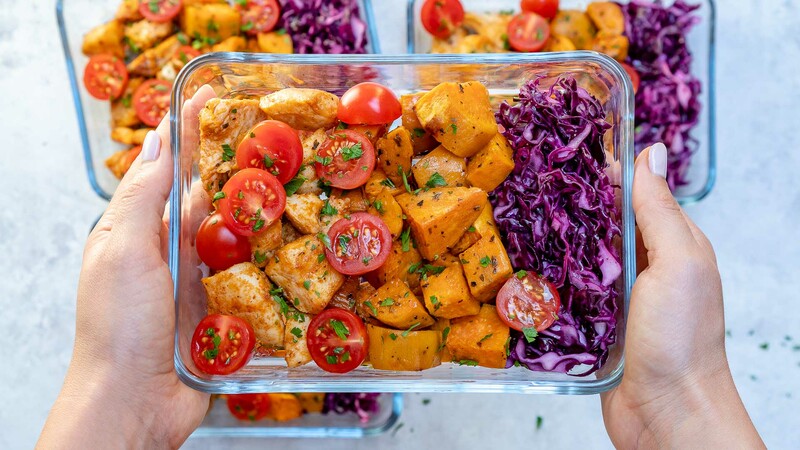 Drizzle diced sweet potatoes with 1 Tablespoon oil and sprinkle with dried oregano, and sea salt and pepper to taste. Toss gently to coat all pieces with oil. Bake in your preheated oven for 20 minutes, tossing once. 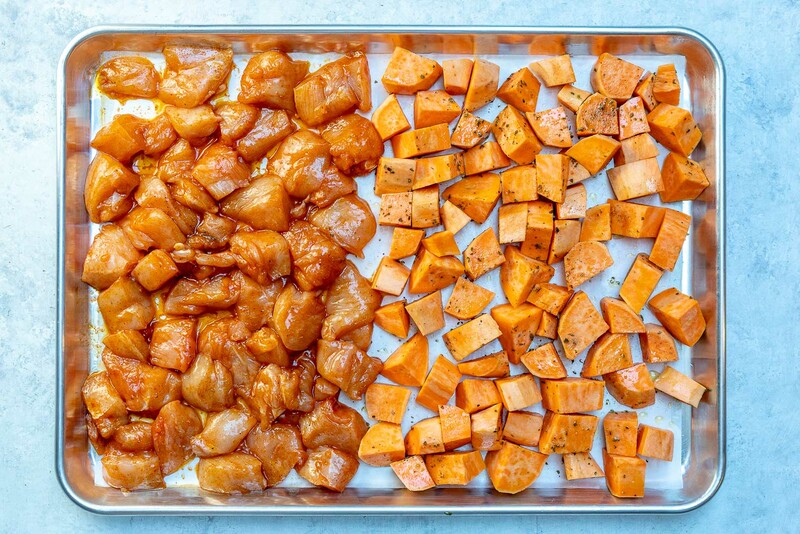 Remove sheet pan from oven, and carefully push sweet potatoes to one side of pan making room for chicken. 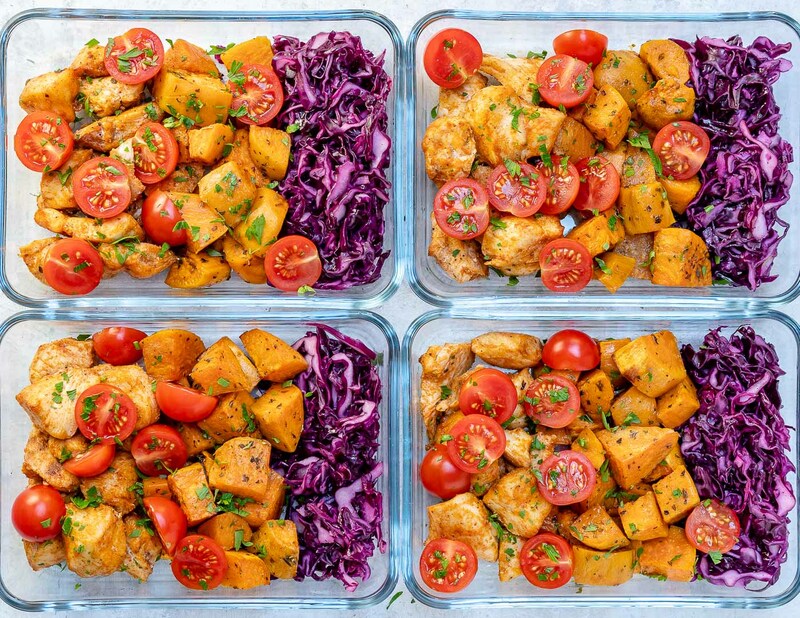 Arrange chicken pieces in a single layer on the other half of the sheet pan. Bake in the oven for 12-15 minutes, or until chicken is cooked through and potatoes are tender and crisp. Meanwhile in a large glass mixing bowl combine red cabbage, with 1 Tablespoon extra virgin olive oil, cider vinegar, sea salt and pepper to taste. Toss well to combine. 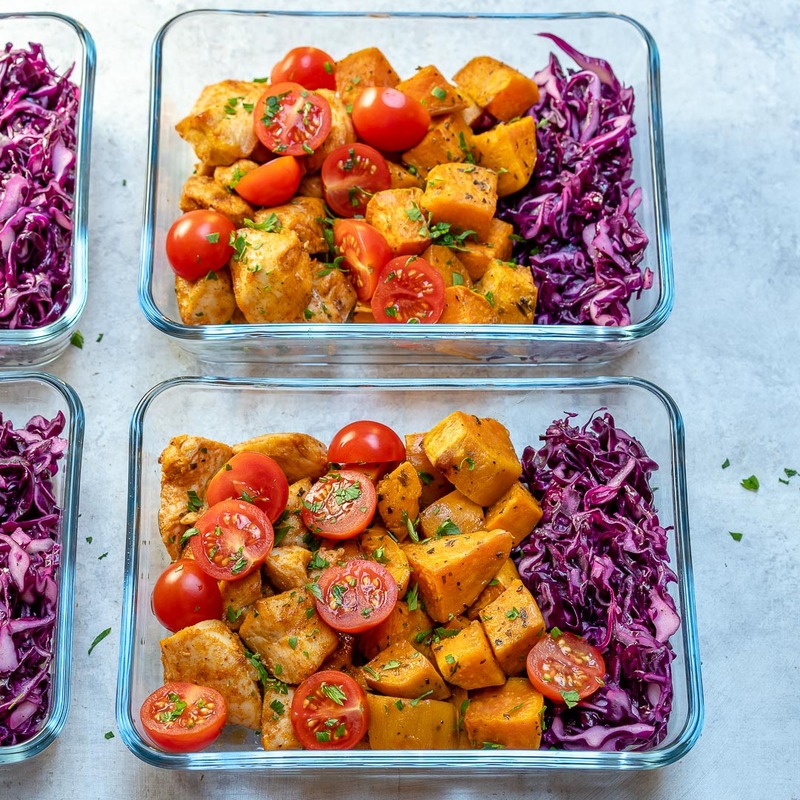 Divide cabbage salad equally among 4 meal prep containers, add sweet potatoes and chicken. Top with equally with cherry tomatoes and sprinkle with fresh chopped parsley. Keeps well refrigerated for 3-5 days. Preheat the oven to 400 degrees f and line a baking sheet with parchment paper. In a large glass bowl, toss chicken with paprika, cumin, sea salt and pepper and 1 Tablespoon of oil. Toss to combine well; set in the fridge, covered for about 30 minutes while you prepare the other ingredients. 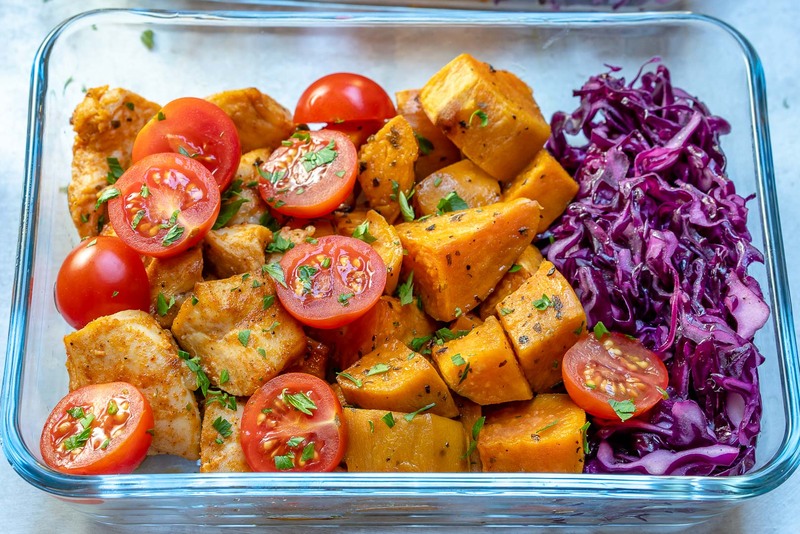 Drizzle diced sweet potatoes with 1 Tablespoon oil and sprinkle with dried oregano, and sea salt and pepper to taste. Toss gently to coat all pieces with oil. Bake in your preheated oven for 20 minutes, tossing once. 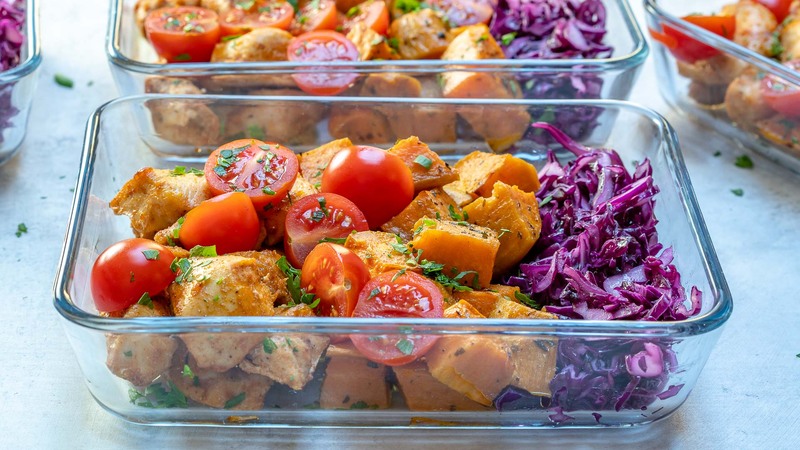 Arrange chicken pieces in a single layer on the other half of the sheet pan. Bake in the oven for 12-15 minutes, or until chicken is cooked through and potatoes are tender and crisp. 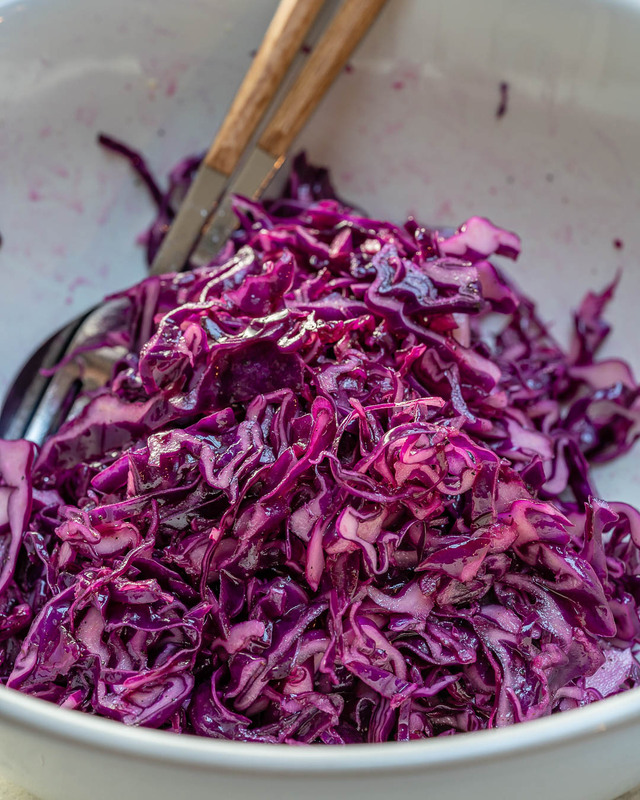 Meanwhile in a large glass mixing bowl combine red cabbage, with 1 Tablespoon extra virgin olive oil, cider vinegar, sea salt and pepper to taste. Toss well to combine. 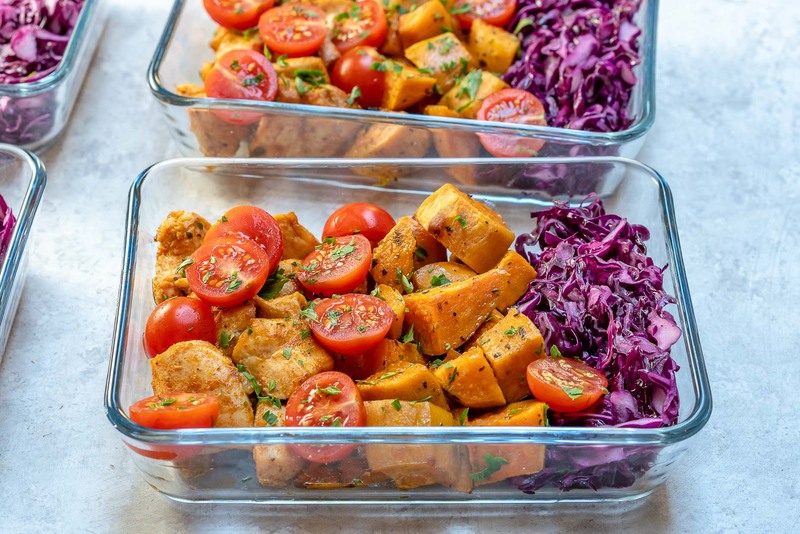 Divide cabbage salad equally among 4 meal prep containers, add sweet potatoes and chicken. Top with equally with cherry tomatoes and sprinkle with fresh chopped parsley. Keeps well refrigerated for 3-5 days.